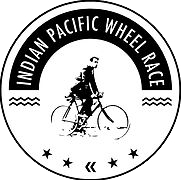 The Indian Pacific Wheel Race (IPWR or Indy-Pac, official website) is a self-supported, ultra-distance bikepacking race across Australia. 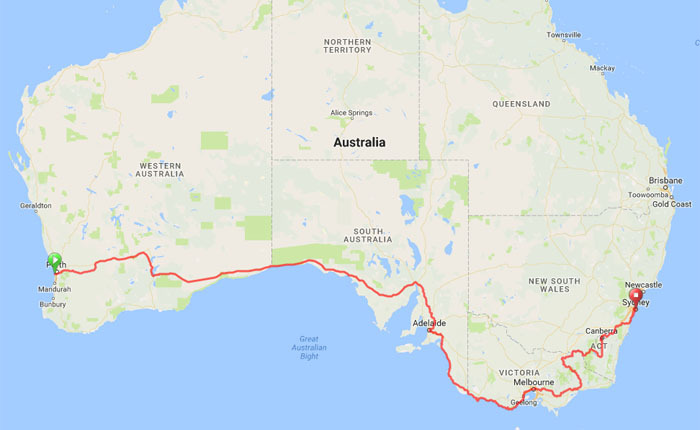 The fixed route is about 5,500 km long and goes from the shore of the Indian Ocean near Perth to the Pacific Ocean in Syndney. The clock never stops and riders must find all of their supplies at commercial sources along the route. During the first half of the race, the Nullarbor Plain must be crossed, which is an arid area without settlements and has minimal services for over 1000 km; for a short section there are not even any trees, which is the origin of the name. During the second half of the race, several major cities must be ridden through plus several sections of hills and the Australian Alps. The race is partly a homage to the Overlanders who crossed large, uncharted parts of Australia by bicycle in the late 19th and early 20th centuries. There was also intense competition to see who could ride between certain cities in the shortest time possible, with attempts receiving a lot of public and media attention. See also the page on the History of Bikepacking Races. Becuase the clock never stops, riders must choose how much time to devote to riding, resting, and refueling each day. Being self-supported or unsupported means that drafting is not allowed, receiving any form of support from other racers is not allowed, nor is it from friends or family; all food, accommodation, repairs, etc., must be purchased from commercial sources. A typical equipment setup consists of a road/racing bike with some small bags carrying a minimal amount of gear and supplies plus a good navigation device and good lighting (see Ride Far, Part II: The Bike). Anticipation was extremely high for the inaugural race because many of the biggest names from similar previous races were racing together for the first time. 70 people started and by the end of the first 24 hours, in which the leaders covered over 600 km, four of the pre-race favorites were in the lead: Kristof Allegaert who’s won the Transcontinental Race three times, Steffen Streich who’s finished 2nd in the Trans Am Bike Race and 4th in the Transcontinental Race, Mike Hall who’s won the Tour Divide twice, the Trans Am and the World Cycle Race, and Jesse Carlsson (the race organizer) who’s won the Trans Am Bike Race and has come 2nd in the Tour Divide. Other well-known riders doing the race included Cycling Maven (Mark Ferguson) and Durian Rider (Harley Johnstone) who each have popular YouTube channels, and Rupert Guinness, an Australian cycling journalist. Nathan Jones was also there; he organizes the Trans Am Bike Race and was doing the Indy-Pac as part of an around-the-world tour. There were also many other veterans of bikepacking races around the world. Unfortunately, Jesse Carlsson had to retire from the race the next day with an injury and Steffen fell back to around 10th position after a few more days. Sarah Hammond, who’s finished sixth in the Trans Am and won the Race to the Rock, moved through the chasing pack to establish herself in 3rd place. Juliana Buhring was expected to be another strong contender because she’s finished in the top 10 of the Transcontinental Race and Trans Am, but she had an allergic reaction to some painkillers on the 2nd and 3rd days and had to return to the start for hospital treatment. She then chose to start the race again, 8 days after the initial start. When going into the Australian Alps section on the 11th day, Kristof still held a comfortable lead over Mike, but stopped for a long sleep partway up the first major Alpine climb, known as the Back of Falls. Mike was close behind by the time Kristof got back on the road on the 12th day and then passed him when Kristof stopped for food. They spent the rest of the day reasonably close, including a couple of hours when they were less than 200 metres apart and trying to match each other’s injections of pace. At the end of the day, Mike Hall finally started to drop back and stopped to sleep. Kristof’s lead extended the next day, and was over 150 km ahead by the start of the 14th day with only about 300 km left to the finish line. Tragically, while riding towards Canberra on the 14th day, Mike Hall had a collision with a car and died. The race organizers decided to cancel the rest of the race. After being informed of the incident, Allegaert chose to honor the memory of his comrade by riding almost to the finish line at the Sydney Opera House, stopping within sight of it but never actually reaching it. Other riders also chose to continue along the route, but many riders stopped and took transport back home or took other routes. Two days after Mike Hall’s death, memorial rides were held in all of the cities that the race had passed, which were attended by many hundreds of cyclists including some of the racers. The race attracted a lot of attention in the general Australian media and many people along the route became aware of it. Riders reported people cheering them from the side of the road even in very small towns, and many people cycled behind each of the leaders as they rode through the major cities. Official race reports can be found on the Race Blog and many videos and updates were posted on the official Facebook page. I was interviewed for The Bike Show podcast talking about the race along with Craig Fry, an Australian cycling journalist. It was announced before the race started that there may only be one edition. After the 2017 edition was cancelled in tragic circumstances, whether there will be any future editions was even more uncertain. Happily, it was announced in late 2017 that the race will be held again in March 2018, applications for which were accepted during November, 2017. Some minor route updates were made for the 2018 edition. A new team category was announced for which the ride was split into 4 segments, and a different team member would ride each segment, still solo and self-supported. In early February, 2018, the organizers announced that as a result of the ongoing inquest into Mike Hall’s death, they had to cancel the race. Many riders decided that this decision wouldn’t stop them from riding across the country on their planned route and starting the ride at the planned time. Backup online tracking options were then established, and as of early February, 2018, it appears that the event will be held in a far more unofficial manner with the original organizers having no involvement. More details are being discussed on the Facebook discussion group, which has recently changed the word “Race” in the event’s title to “Ride”. This page is in Ride Far, Part III: Bikepacking Race Information.